Eight candidates are slated to vie for three seats on the Hoboken Board of Education this November. Two of the eight are incumbents: Jennifer Evans elected in 2013 and Irene Sobolov, the long time education activist and 2010 Elks Club Citizen of the Year. The third BoE trustee seat held by Leon Gold who is not running for re-election will be contested among the outstanding candidates. BoE Trustee Jennifer Evans addresses a packed downtown venue after a Reform sweep in 2013's November elections. On her right and joining her in the 2016 race is Irene Sobolov. 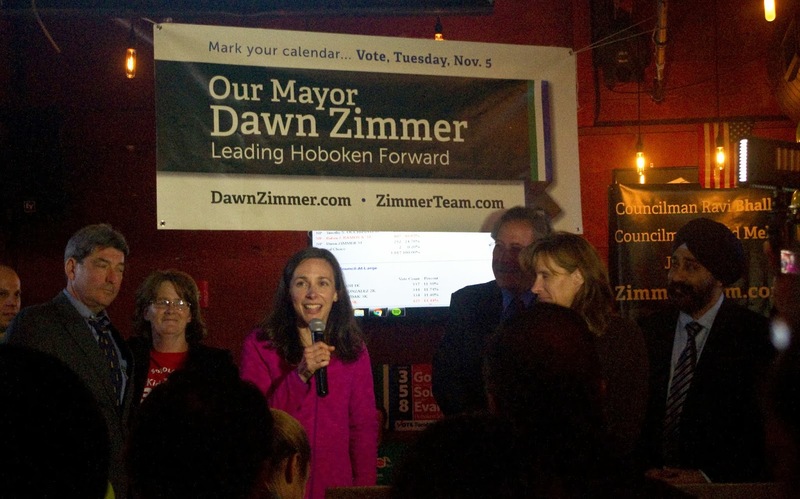 Leon Gold, shadowed on her left by Mayor Dawn Zimmer is not seeking another three year term. One ticket, anticipated under the Reach Higher banner will include Evans, Sobolov and Sheillah Dallara who was a candidate on that ticket last year but came up short when over 600 Vote-by-Mail ballots were tabulated late and erased what looked like that ticket's sweep. A slate of three likely to oppose Reach Higher are Francis "Chipper" Benway, Jessica Nelson and Jennifer Rossini. Two other candidates may join to run an incomplete third slate in Cory Johnson and Zach Weiss. Johnson who works in the realty industry is a graduate of Hoboken High School and was appointed by the Hoboken City Council as an alternate to the Hoboken Zoning Board of Adjustment early this year. One issue anticipated this fall is the continuing lawsuit against the expansion of the upper elementary grades of the HoLa charter school. Leon Gold who some anticipated would run for another three year term declined an interview to discuss his decision. Via email he offered, "I am not running because I am no longer effective on the board." Other possible issues in this November's BoE races may include taxes, facility expansion and teacher contracts approved. Update: Other than the Reach Higher ticket, MSV may not have the final opposition groupings set. One well-placed source says two women candidates are actually linked to Freeholder Anthony "Stick" Romano. This is fluid and will be confirmed in due course.